Despite being just the 17th rapid transit line in the People’s Republic of China, the Hangzhou Metro began operations not so long ago, in the year 2012. Functioning on 3 lines and serving 57 stations in total, it has a daily ridership of approximately a million passengers. Not only does it serve the city of Hangzhou but it extends its operations to the suburbs as well. Currently just 81.5 km long, the metro is just a fraction of what is planned for it. Infact, the metro is supposed to have 8 lines, stretching not less than 278 km if things go according to plan. Running for around 4 years now, under the operations of MTR Corporation (Hangzhou), the future of the metro looks secure to say the least. ● Line 2: Liangzhu to Shushan (48km). ● Line 3: Gongshu to Shangcheng (35km). ● Line 5:Termination at Xiaoshan Railway Station (48km). ● Line 6:Connection with Jiangnan Yanjiang, Binjiang District, Qianjiang Century City and Qianjiang Culture Industrial Park (25km). ● Line 7: connection with Jiangdong Area and Qianjiang Century City (31km). ● Line 8: connection with Jiangdong Area and Xiasha District (18km). 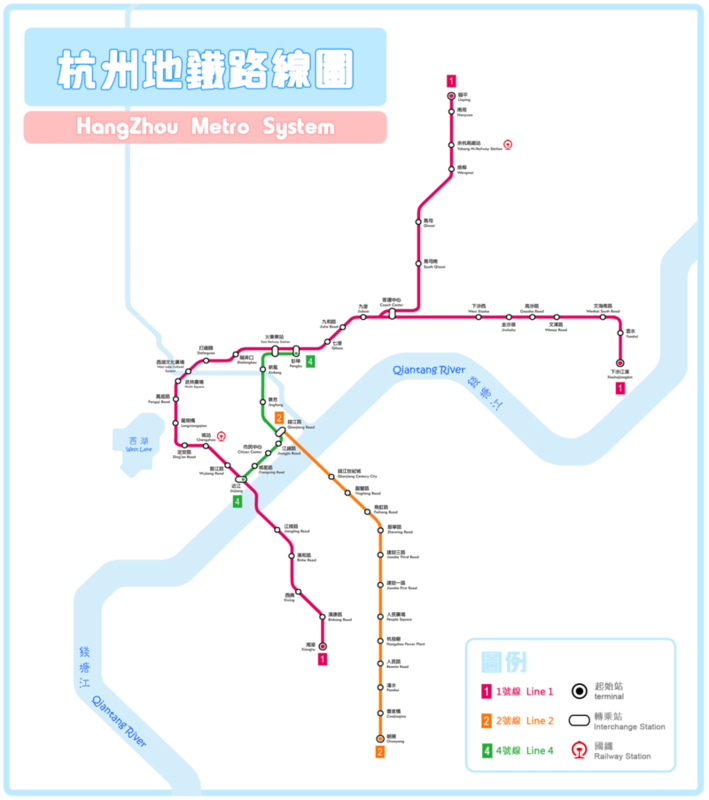 System Map of Hangzhou Metro showing various the Lines and Stations of Hangzhou Metro. The metro begins operations at around 06:00 am in the morning, and runs till 00:00 am midnight. The fares for the Hangzhou Metro system are distance based. For 4km, the ticket costs 2 yuan. This is infact, the starting price for the metro. As the distance increases, so does the price but by different amounts. When travelling between a distance of 4-12 km, 1 yuan is added to the fare for every 4 km travelled. However, if the distance of travel is between 12-24 km, only after every 6 km an additional 1 yuan is charged to your fare. If the distance is more than 24 km, then 1 yuan for every additional 8 km respectively. Disabled people, subject to some terms and conditions can make use of the metro service for free. Elderly citizens of the age 70 and above, can purchase tickets for half the price during peak hours and use the metro service for free at other times of the day. Senior citizens aged between 60-69, enjoy a 50% discount on the tickets, provided they can furnish the required documents. Similarly, students from secondary, vocational school etc, enjoy a similar advantage. There is no particular age for children under which they get free access to the metro. However, if the child is under 1.3 meters tall, he/she can use the metro for free provided they are travelling with an adult. Hangzhou is planning to build 41 parking areas near metro stations in the next seven years to erase traffic in suburban areas. There will be 9 parking lots on metro line 1 and five lots along line 2. All the parking lots are located outskirts and just 500 meters from the metro station. People can leave their car in the parking lots and can take a walk to the metro station. Transit of bikes and pets is prohibited. Similarly, alcohol consumption and eating is strictly not allowed within the metro network. Hangzhou Metro System Information on Wikipedia.